One beautiful spring morning on an reservation in North Dakota the lives of one family were changed forever. It started out with 13-year old Joe and his father, Bazil Coutts, the tribal judge on an Indian Reserve in North Dakota, as they contentedly work together at spring yard cleanup. As the day turns to early evening concern of the whereabouts of Joe's mother mount. Even if she'd gone to visit her sister after running her errands she would have returned by now to start dinner. "Women don't realize how much store men set on the regularity of their habits. We absorb their comings and goings into our bodies, their rhythms into our bones. Our pulse is set to theirs, and as always on a weekend afternoon we were waiting for my mother to start us ticking away on the evening. And so, you see her absence stopped time." Deciding to see if Joe's mother has had car problems and requires help, the two of them borrow their neighbors car and set off to find her. Much to their relief they pass her as she is returning home and turn around to join her, arriving back home moments later to find her still sitting in the car, covered in blood and smelling of gasoline. Geraldine Coutts was the victim of a brutal attack. Unwilling to talk about the attack she takes to her bed and proceeds to shut out her husband and son as she withdraws into herself. Unable to get answers from Geraldine, Bazil and Joe are forced to get them elsewhere and together start to review prior court files in the hopes that a clue can be found in them. As Bazil continues with this avenue, Joe takes other measures in his quest to find who did this to his mother and destroyed the peaceful safety of his home and family. The story is told by Joe and through his eyes we slowly learn what happened and even more slowly learn who assaulted her and why. We learn of the difficulties to get justice on an reservation. We learn a lot about tribal customs, beliefs and also injustices not only from the past but ongoing into the present. Old sins do indeed cast long shadows. This book is not only a book with a mystery, but a book about family, friends, love, loyalty, betrayal, evil and injustice where a young boy and his friends are forced to grow up quicker and with more lasting consequences than they should. 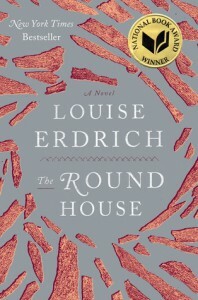 This book won the National Book Award for Fiction (2012) and was thought by a few book critics that it could be a contender for the Pulitzer this year. Was it good? Yes, but for me a book should be more than just good to warrant such a prestigious award as the Pulitzer. It should be great and The Round House for me failed to live up to that standard and its potential. It had all the makings for a real nail-biter but instead spent so much time on past crimes and legal wranglings that it lost its momentum and failed to recover it completely. Despite the perceived failings there was much to like about The Round House and I'm sure most readers will enjoy it thoroughly. As GR does not allow for 1/2 star ratings I have rounded it down to 3.